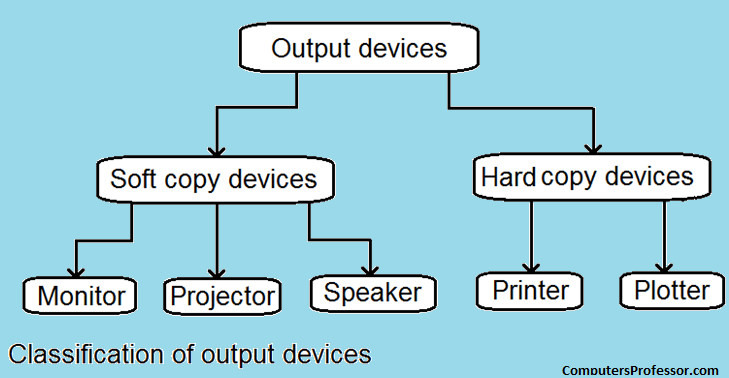 Explain about output devices of computer ? 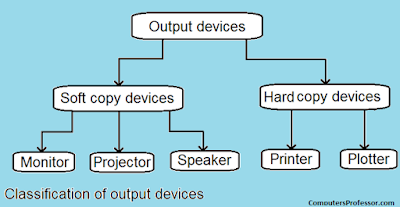 Any device that output / gives information from a computer can be called an output device. Basically, output devices are electromechanical devices that accept digital data (in the form of 0s and 1s) from the computer and convert them into human-understandable languages. · The output can be viewed only when the computer is on. · The user can easily edit soft copy output. · Soft copy cannot be used by people who do not have a computer. · Searching for data in a soft copy is easy and fast. · Electronic distribution of materials as soft copy is cheaper. It can be done easily and quickly. The monitor is a soft copy output device used to display video and graphics information generated by the computer through the video card. Computer monitors are similar to television screens but they display information at a much higher quality. Monitors come in three variants – cathode ray tube (CRT) liquid crystal display (LCD), and plasma. CRT monitor work by firing charged electrons at a phosphorus film. When electrons hit the phosphor-coated screen, they glow, thereby enabling the user to see the output. · CRT monitors provide images of good quality (bright as well as clear). · CRT monitors are cheapest when compared to LCD and plasma monitors. · The images are clear even when you try to view it from an angle. · CRT monitors occupy a large space on the desk. · They are bigger in size and weight and therefore difficult to move from one place to another when compared with other types of monitors. · Power consumption is higher than the other monitors. An LCD monitor is a thin, flat, electronic visual display unit that uses the light modulating properties of liquid crystals, which do not emit light directly. LCD screens are used in a wide range of applications ranging from computer monitors, television, instrument panels. LCD screens are more compact, lightweight, portable, more reliable, and easier on the eyes. · LCD monitors are very compact and lightweight. · They consume less power. · They do not suffer from geometric distortion. · There is little or no flicker of image (depending on the backlight technology used). · They are more reliable than CRTs. · They can be made in almost any size or shape. · They cause less eye fatigue. · They are more expensive than CRTs. · Images are not very clear when tried to view from an angle. These monitors are thin and flat monitors widely used in televisions and computers. · The technology used in plasma monitors allows producing a very wide screen using extremely thin materials. · Very bright images are formed which look good from almost every angle. · These monitors are not heavy and are thus easily portable. · These monitors are very expensive. · They consume much power. · Since the images are phosphor-based, at times, they may suffer from flicker. A projector is a device that takes an image from a video source and projects it onto screen or another surface. Projectors also allow users to change / adjust some features of the image such as brightness, sharpness, and colour settings, similar to the features available in a standard television. Projectors are now available in a variety of shapes and sizes, and are produced by many different companies. Projectors can be broadly classified into two categories depending on the technology they use. LCD projectors make use of their own light to display the image on the screen / wall. These projectors are based on LCD technology. To use these projectors, the room must be first darkened, else the image formed will be blurred. DLP projectors use a number of mirrors to reflect the light. When using the DLP projector, the room may or may not be darkened because it displays a clear image in both situations. Today, all business and home users demand audio capabilities from their computers. For this purpose, speakers were developed in different sizes and shapes, and with different powers and sound quality. With all these types of speakers, the user can enjoy music, movie, or a game, and the voice will be spread through the entire room. However, in case the user wants to enjoy loud music without disturbing the people nearby, a headphone can be used. Headphones are small devices that fit in or on the ear, and give about the same quality and power of the sound, as the speakers, only to the listener. Another device called the headset was developed to allow users to talk and listen at the same time, using the same device. Headsets are widely used in call centers and other telephone-intensive jobs, and for personal use on the computer to facilitate comfortable simultaneously conversation and typing. 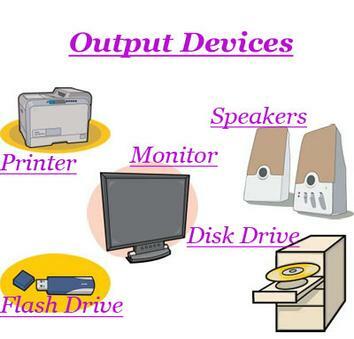 Hard copy output devices produce a physical form of output. For example, the content of a file printed on paper is a form of hard copy output. · A computer is not needed to see the output. · Editing and incorporating the edits in the hard copy is difficult. · Hard copy output can be easily distributed to people who do not have a computer. · Searching for data in a hard copy is a tiring and difficult job. · Distribution of a hard copy is not only costly but slow as well. A printer is a device that takes the text and graphics information obtained from a computer and prints it on to a paper. These printers print characters by striking an inked ribbon against the paper. · These printers enable the user to produce carbon copies. · Impact printers are slow. · They offer poor print quality, especially in the case of graphics. · They can be extremely noisy. · They can print only using the standard font. These are much quieter than impact printers, as their printing heads do not strike the paper. They offer better print quality, faster printing, and the ability to create prints that contain sophisticated graphics. · Non-impact printers produce prints of good quality, and hence render sophisticated graphics. · They can print text in different fonts. · These printers are expensive. · The ink cartridges used by them are also costly. A dot matrix printer prints characters and images off all types as a pattern of dots (hence the name). This printer has a print head (or hammer) that consists of pins representing the character or image. The print head runs back and forth, or in an up-and-down motion on the page and prints by striking an ink-soaked cloth ribbon against the paper. The speed of dot matrix printers varies in the range of 50–500 cps (character per second). · The dot matrix printer can produce carbon copies. · It offers the lowest printing cost per page. · It is widely used for bulb printing where the quality of the print is not of much importance. · When the ink is about to be exhausted, the printout gradually fades rather than suddenly stopping partway through a job. · It can used continuous paper rather than individual sheets, making them useful for data logging. · This type of printer creates a lot of noise when the pins strike the ribbon against the paper. · It can only print lower resolution graphics, with limited quality. · It is very slow. · It has poor print quality. A daisy wheel printer uses an impact printing technology to generate high-quality output comparable to typewriters, and is three times faster. The key benefit of using a daisy wheel printer is that the print quality is high, as the exact shape of the character hits the ribbon to leave an impression on the paper. A line printer is a high-speed impact printer in which one typed line is printed at a time. The speed of a line printer usually varies from 600 to 1200 lines per minute, or approximately 10-20 pages per minute. Because of their high speed, line printers are widely used in data centers and in industrial environments. A band printer (loop printer), is an impact printer with a printing mechanism that uses a metal loop or band to produce typed characters. The set of characters are permanently embossed on the band, and this set cannot be changed unless the band is replaced. The band itself revolves around hammers that push the paper against the ribbon, allowing the desired character to be produced on the paper. The main advantage of using a band printer is its high speed. This type of printer can print 2,000 lines per minute, and it, therefore, perfect for high volume printing in businesses, schools, and other organizations. Inkjet printers have made rapid technological advances in recent year. The print head of inkjet printers have several tiny nozzles, also called jets. As the paper moves past the print head, the nozzles spray ink onto it, forming characters and images. While inkjet printers are cheaper than laser printers, they are more expensive to maintain. The cartridges of inkjet printers have to be changed more frequently, and the special coated paper required to produce high-quality output is very expensive. · A laser beam ‘draws’ the document on a drum (which is coated with a photo-conductive material) using electrical charges. · After the drum is charged, it is rolled in a toner (a dry powder type of ink). · The toner sticks to the charged image on the drum. · The toner is transferred onto a piece of paper and fused to the paper with heat and pressure. · After the document is printed, the electrical charge is removed from the drum and the excess toner is collected. A plotter is a printing device that is usually used to print vector graphics with high print quality. They are widely used to draw maps, in scientific applications, and in CAD, CAM and computer aided engineering (CAE). Architects use plotter to draw blueprints of the structures they are working on. A plotter is basically a printer that interprets commands from a computer to make line drawing on paper with one or more automated pens. Since plotters are much more expensive than printers, they are used only for specialized applications. There are two different types of plotters, drum and flatbed. This type of plotter is usually used with mainframe and minicomputer systems. Drum plotters can make multicolour drawings by using pens with different coloured inks. Plotters are less expensive, and are used in many small computer systems.